Theodore Lyman describes the fighting along the White Oak Road on March 31. 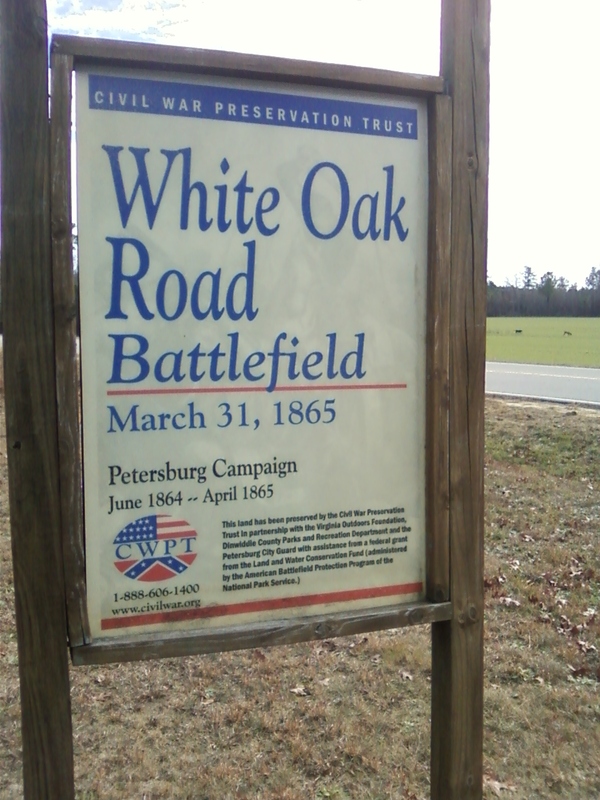 The little battlefield today is another of the Civil War Trust’s success stories and includes some trails that wind through the woods on both sides of the road, with markers among the trees that explain the action. Lee rode out here to supervise the fighting, knowing that the White Oak Road was an important supply line for his army. The rebels smashed into the Federal flank, forcing back the divisions of Romeyn Ayres and Samuel Crawford, but the Union soldiers counterattacked and pushed the rebels back to their earthworks. With the White Oak Road in Union hands, the Confederates off to the west around an intersection called Five Forks were now separated from the rest of the army. Charlie Mills had served with the 56th Massachusetts and on the staffs of several generals. The Abbott to whom Lyman refers is Henry Abbott of the 20th Massachusetts, killed in the Wilderness. The rain held up about ten a.m. and the sun once more shone. By this time our lines, running east and west, had been moved due north, till they rested their right on Hatcher’s Run, north of the Crow house, and their left on the Boydton plank, near the entrance of the Quaker road. For this purpose Ayres’s and Crawford’s divisions were pushed forward and Griffin held in reserve. We rode out, towards the left (our Headquarters were near the Vaughan road close to Gravelly Run), stopping some time to consult with Grant. About 10.30 we heard a brief fusillade on the right of our line (a demonstration to divert our attention), followed by heavy musketry towards the White Oak road. As we came to Warren’s old Headquarters, high up on the Quaker road, I could see something had gone wrong. A cavalry officer galloped up and said: “I must have more men to stop these stragglers! the road is full of them.” And indeed there were those infernal drummers, and pack-mules, and not a few armed men, training sulkily to the rear. I required no one to tell me what that meant. The enemy had tried on Griffin, two days since, without success, but this time they had repeated the game on Ayres and Crawford, with a different result. As these two divisions were moving through the thick woods, they were suddenly charged, broken, and driven back towards the Boydton plank road; but some batteries being brought to their aid, the men were rallied behind a branch of Gravelly Run. Griffin took up a rear line, to ensure the position. General Meade at once ordered Miles to go in, to the right of the 5th Corps, and Griffin to advance likewise. The General rode out in person to give Humphreys the necessary orders about Miles’s division, and found him at Mrs. Rainie’s, at the junction of the Quaker road and the plank. There was a wide open in front, and I could see, not far off, the great tree where we got such an awful shelling, at the first Hatcher’s Run fight. Miles was in the open, forming his troops for the attack. Just then the enemy opened a battery on us, with solid shot, several of which came ricocheting round us. I recollect I turned just then and saw Charlie Mills sitting on horseback, near General Humphreys. He nodded and smiled at me. Immediately after, General Meade rode to a rising ground a couple of hundred yards from the house, while General Humphreys went a short distance to the front, in the field. Almost at that instant a round shot passed through Humphreys’ Staff and struck Mills in the side, and he fell dead from his horse. He was indeed an excellent and spirited young man and beloved by us all. . . . When I rode that evening to the hospital, and saw the poor boy lying there on the ground, it made me think of Abbot, a year ago. It is the same thing over and over again. And strange too, this seeing a young man in full flush of robust health, and the next moment nothing that we can make out but the broken machine that the soul once put in motion. Yet this is better than that end in which the faculties, once brilliant, gradually fade, month after month. About noon, Miles and Griffin went in, with sharp firing, drove the enemy back, and made a lodgment on the White Oak road. Meantime, Sheridan, after all sorts of mud toils, got north of Dinwiddie, where he was attacked by a heavy force of infantry and cavalry and forced back nearly to that place. Not to forgo our advantage on the northwest, we immediately sent the whole 5th Corps by night to Dinwiddie to report to General Sheridan and attack the enemy next morning — a hard march after the two days’-fighting in the storm! Theodore Lyman’s letter is from Meade’s Headquarters, 1863-1865: Letters of Colonel Theodore Lyman from the Wilderness to Appomattox, pp. 330-2. Edited by George R. Agassiz. Boston, Massachusetts Historical Society, 1922. Available via Google Books.